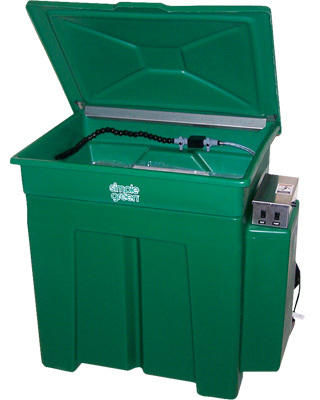 The Simple Green 60 Gallon Parts Washer saves time and effort when cleaning and degreasing industrial parts. The sturdy washer is made of heavy-duty industrial grade polyethylene plastic with a stainless steel work shelf. It has a load capacity of 200 lb and delivers an optimal fixed thermostat temperature of 105°F. The Flexible Loc-Line® nozzle with polyester filament flow-through brush allows easy cleaning without damaging delicate parts. The unit is GFCI protected and comes with separate power switches for the heater and pump.